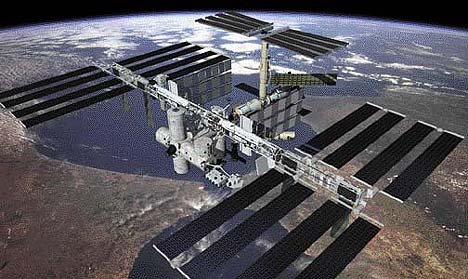 The International Space Station will be visible again in the sky above southern California every night for the coming week. The ISS will be visible as one of the brightest (mostly the brightest) star-like object in the sky as it passes approx 200 miles overhead at over 17000 mph. note: above predictions provided by the web site http://www.Heavens-Above.com. As the above table shows the predications as captured on Jun 11th the information may not remain accurate. Please check the latest predictions here. These predictions are centered for an observer near Los Angeles, CA and will work reasonably well for anyone in Southern California. If you live further away please select your own location on the Heavens-Above.com web site. This entry was posted in Man-made Satellites by liam. Bookmark the permalink.